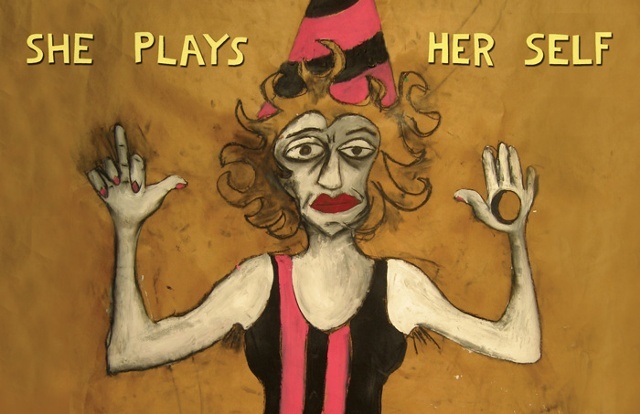 Cate White's installation, SHE PLAYS HER SELF (cut-outs, cut-ups and cut-downs), plays with more than herself. She is playing with the structures of identity and playing with you too, if you're up for it. The 1500 square foot gallery space is animated by ceiling-high paper cutouts and all manner of scattered and suspended papier-mâché sculptures, whose naïve goofiness barely conceal a cutting wit. Is she angry? Or was that just a joke? Using paper effigies of her own body as both player and gameboard/battleground, the artist rearranges the parts and pieces of the material self, traversing the margin between savage self-destruction and playful self-deconstruction. Represented in an undignified Crayola flesh tone, the figure is cut out, dislocated, exploded, purged and devoured, skinned and wrapped, converted into a piñata, grafted onto nature, and intermixed with language. The result is a libidinous realm of criss-crossed boundaries where it seems there is an edgy kind of fun to be had. Ordered distinctions-between inner and outer, thought and flesh, sense and nonsense, image and essence-are all tossed up into the air like so much confetti. In this atmosphere, separation between artist, art and audience begins to dissolve, and an enlivened, inter-subjective experience of the self becomes possible.